Note to Northern Canadian Users: OTAMap does work everywhere in Canada, however you may need to flip on the Industry Canada Data in the preferences. Please see this comment for further information. Version 2.1 is here (Aug 2014)!! Includes Compass functionality! Version 2 is here (July 2014)!! 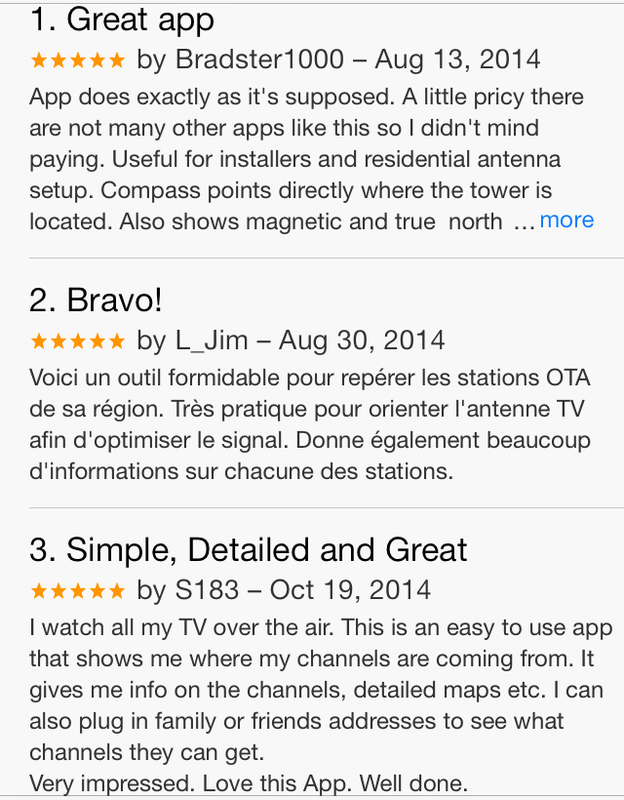 Our first app OTAmap is used to help Digital TV owners point their antennas. Version 2 is a total rewrite with over 10,000 lines of new beautiful OOC code. You can filter station list based on distance, power, FCC data, Industry Canada data, Canadian, Mexican and US stations. You can now even filter based on whether your location falls within a stations 41 dBU Contours! You can sort the displayed stations by distance, channel, power or even it's bearing from you. Or a previously saved location. Download and update latest FCC station data anytime. No longer server based. Some functionality will run without a network connection. If a particular map was previously loaded, even mapping functionality may work offline. Fixed magnetic declination (no longer IRC dependent) (may be off as you near the Arctic Circle). Added ability to add stations/save maps to a DX list. The list can be pulled up anytime and the pointing maps reviewed. Added Super Contour Map. Given a particular location it will list all stations that fall within the 41dBu contour map which should indicate stations that should be received relatively easily. Will show curves of all coverage contours and darken overlapping sections. I have to admit - it is cool. The resulting stations can then be viewed as your filtered station list. Added a search for call sign option. This will allow mapping of super long range reception or help in obscure DX attempts. Now works for all of the Great White North - Uses IRC data for anything not included in the FCC database. IRC data is usable but slightly out of date and awkward to upgrade. Someone needs to tell them that the 1990's wants their .dbf and .exe files back. In the station pointing map view the map can be updated if the users gps determination has changed. In the station pointing and the all station map views, you can drag the home icon to say a different part of the roof/yard and the calculations will follow. You can erase your downloaded data (which may include FCC FM/TV database and any cached contours) and restore to original data from preference menu. Not sure if this is needed, but no harm. So far three reviews all 5/5!! I appreciate the great feedback as I thought I covered all features possible and produced a well functioning app. Typically people mainly comment when they have a negative opinion, so these reviews are even more satisfactory.